Critically acclaimed author Cammie McGovern presents a heartwarming and humorous middle grade novel about the remarkable bond that forms between an aspiring service dog and an autistic boy in need of a friend. 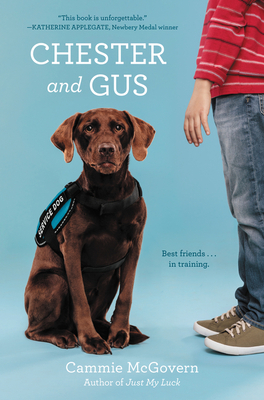 “Joyful, inspiring, and completely winning, Chester and Gus is unforgettable,” proclaimed Katherine Applegate, #1 New York Times bestselling author of the Newbery Medal winner The One and Only Ivan. Chester has always wanted to become a service dog. When he fails his certification test, though, it seems like that dream will never come true—until a family adopts him. They want him to be a companion for their ten-year-old son, Gus, who has autism. But Gus acts so differently than anyone Chester has ever met. He never wants to pet Chester, and sometimes he doesn’t even want Chester in the room. Chester’s not sure how to help Gus since this isn’t exactly the job he trained for—but he’s determined to figure it out. Because after all, Gus is now his person. In the spirit of beloved classics like Because of Winn-Dixie, Shiloh, and Old Yeller, Cammie McGovern’s heartfelt novel—told from Chester’s point of view—explores the extraordinary friendship between a child and a dog with a poignant and modern twist. Cammie McGovern is the author of Say What You Will as well as the adult novels Neighborhood Watch, Eye Contact, and The Art of Seeing. Cammie is also one of the founders of Whole Children, a resource center that runs after-school classes and programs for children with special needs. She lives in Amherst, Massachusetts, with her husband and three children.